Our class has enjoyed the unit about bats. We learned about the parts of a bat's body, the kind of foods bats eat, the process of echolocation, bat facial characteristics, bat babies, and places where bats live. Some of our favorite activities include: reading bat poetry and stories, drawing bat pictures on paper and on Kid Pix, designing and creating bulletin boards, playing games exhibiting bat behaviors, making our own bat mask, and preparing bat fruit salad. We even turned an area of our room into a bat cave. When it gets a little warmer, we're going to walk to the zoo and visit live bats. Have fun exploring the variety of activities we did during our bat unit. 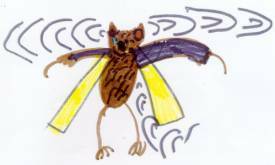 We hope you enjoy all the wonderful things we did during our study of bats.